Though some scientists are realizing that our world is like a house of mirrors, they are not yet able to lead us out of it. You probably have no reason to believe that your senses are unreliable sources of knowledge. Your seeing, hearing, tasting, smelling, and touching faculties may deceive you occasionally—as when you see an optical illusion—but it’s nothing too serious. They give an accurate picture of reality most of the time. Besides, other persons confirm this by agreeing with you about the nature of the objects and events you perceive. In the Bhagavad-gita Krishna says that our world is not an objective one; rather, it’s subjective, pliant, endlessly mutable. In other Vedic literature it’s explained that our senses, the very means by which we gather data about the world, are unreliable because they are prone to illusion. They don’t give us direct access to an objective world; rather, they give an illusion of objectivity. Krishna calls this illusion maya. Sometimes the concept of maya is taken to mean the world is an illusion, but that’s not exactly what Krishna says. 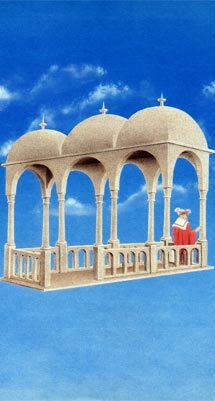 According to Him, the material world is very real, but, like a house of mirrors, its purpose is to delude us. In a house of mirrors, the house and the observer are real, but because the mirrors distort reality within the house, the images perceived within it are illusory. Similarly, the physical world is real, you and I are real, but like the mirrors in a fun house, our material senses distort our perceptions. Being oblivious to this built-in imperfection, however, we take our distorted perceptions as reality. Since we rely on our senses all the time for access to the external world, we’re no better off than a person trapped in a house of mirrors. We’re continuously in illusion, or maya. For a long time the concept of maya made little sense to us in the Western world. Few persons, even if curious about Vedic thought, gave serious attention to Krishna’s doctrine of illusion. It made for interesting discussion on occasion, but few wanted to take it any further than that. This is changing in recent years. In some circles it’s now fashionable to try to reconcile various aspects of Vedic thought with the physical sciences, and a few books on this theme have gone over well with the public. The prime objective of these science-and-spirituality books has been to show similarities between the theoretical subatomic world of quantum physics and the Vedic world view. By demonstrating that Western science and hoary Eastern spirituality are moving toward the same end, these books offer hope that we may yet see a happy union of science and spirituality. Still, despite any apparent agreement between Vedic thought and the new physics, and despite the increasing popularity of that view, for most people the idea that life’s an illusion remains untenable, and to sold-out materialists it’s downright ridiculous. But according to Charles Tart, a psychology professor at the University of California, the doctrine of illusion is far from ridiculous. In The Psychobiology of Consciousness, a collection of papers by researchers in related fields of psychology and biology, Tart draws on his twenty-odd years of research and on the work of others to present evidence that confirms, inadvertently, Krishna’s depiction of our condition as one of deep illusion. Tart is not alone in his conclusions. Robert Ornstein and Richard Strauch, authors of The Psychology of Consciousness and The Reality Illusion, respectively, both make a case to show that our world is an illusion-generating one, in which much of the illusion mechanism is built right into the instruments we rely on to observe and analyze the world: our senses. These up-to-date findings by various individuals and groups researching consciousness—the most essential element of our existence—show that much of what we experience as reality is in our own heads. Our senses, rather than giving us unadulterated access to the physical world, limit how much data we receive. The resultant partial picture combines with our expectations, pre- existing beliefs and assumptions, and past experiences to give us our personally constructed reality. The sights, sounds, smells, and shapes you experience are to some degree perceptions you create yourself. Hence reality, like beauty, is in the eyes of the beholder. Our senses work on the world the way a sculptor works on his block of marble. As he chisels, he discards pieces of marble and extracts his statue from a wide range of possibilities. Another sculptor may give a different interpretation to the same piece of marble. Or the same sculptor, at another time, may give it an entirely new interpretation. So it is with physical reality: we interpret or shape it according to what we discard, and at different times we give it different interpretations. The main difference between us and the sculptor is that we are not usually as conscious of the selection process. A familiar but good example of the selection process at work is the faces/vase drawing in Figure 1. 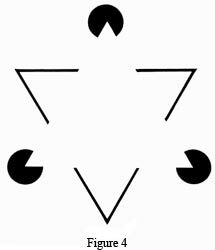 Depending on which image you choose to discard, the drawing is either a black vase or the outline of two white faces looking toward each other. Both images are present, but you can’t see them both at the same time. Consciously or unconsciously, you select one and discard the other. Figure 2 is a similar example of the selection process at work. The picture is either a young woman or an old woman, depending on how you choose to interpret the data before you. 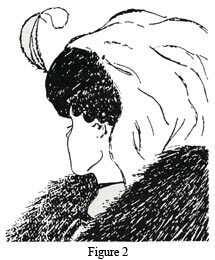 This is usually a more difficult one than the faces/vase picture, but see if you can spot both women. The context in which you see something also plays an important role in perception and interpretation. 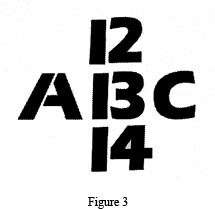 The middle character in Figure 3 is either a number or a letter, depending on the context you choose to see it in. Without a context you wouldn’t be able to tell whether it is the letter B or the number 13. Our senses also distort things and supply information not given. In Figure 4, for example, our eye imagines the lines that form a white triangle. All the senses have many known deceptions. To our tongues carbonated water tastes colder than ordinary water at the same temperature. Prolonged contact with dry ice registers in the brain as a burning sensation. In addition, we know there are sound frequencies our ear cannot hear, like the dog whistle, for example. Similarly, our eyes can perceive only a small portion of the light rays that we know exist. (Figure 5). A frog’s eyes take in even less of the external world than ours do. In experiments where hundreds of colors, shapes, sizes, and movements were placed within seven inches of a frog’s eyes, only four kinds of messages went from its eyes to its brain. The frogs eyes can (1) give it a general outline of the environment, (2) enable it to detect sudden movements of shadows, and (3) enable it to detect sudden decreases in light. Predictably, the frog’s fourth kind of visual response is that it can see small dark objects, like flies and other insects, approaching. A frog’s eyes so limit how much the frog perceives that even within the range of seven inches, the rich and varied visual world our eyes enjoy is nonexistent to it. In a frog’s world, elephants don’t exist as elephants, but probably as earth-shaking shadows. Frogs—or ants or rhinos or seagulls—live their own reality illusion. These are just a few relatively simple examples out of dozens, but they give us some idea how unreliable our senses are and how subjective and relative reality is. Not only does the same reality appear differently when perceived from different viewpoints—a tree seen from the air and from the ground, say—but even from a single perspective, a fixed set of data may be interpreted in more than one way. 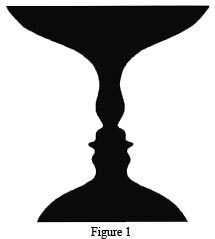 The same set of facts may appear differently to different persons, or even to the same person at different times, as in the faces/vase figure. Or the same facts may be seen differently in different settings, as in Figure 3. All this knowledge about how the senses function—or malfunction—gives rise to a few intriguing questions: Of what we perceive, how much of it is a distortion of what’s actually there? How much of the world are we not perceiving at all? And how much of it do we imagine by aural, visual, and tactile hallucinations? In short, how can we distinguish reality from illusion? The answer is, we don’t know. We’ll never know. For, as the research indicates, we simply have no method for perceiving the world without its being filtered and therefore distorted by our senses. Alert to this fact, the Vedic literature sometimes uses another word to describe our condition; durga, or “prison.” We are imprisoned in the illusions fed to us by our senses. But if we don’t live in an objective reality, if we are so entrenched in maya, how are we able to agree on so much of our experience? How can we even converse about objects and events in the world? Tart explains that we can talk about reality as objective because of the high degree of agreement we share in our individual realities. From birth we condition our senses to select and interpret phenomena the same way others around us do, forming in effect a consensus reality illusion: many individuals sharing an agreed-upon way of interpreting their environment. Through this consensus illusion we perpetuate belief in an objective reality from one-generation to the next. Wherever a group of people adhere to the same consensus reality, it’s called a culture. As the diverse cultures around the world testify, there are many ways of interpreting the physical world, many different consensus reality illusions. And, as with individual realities, sometimes consensus realities overlap. Tart and other researchers, like Robert Rivilin and Karen Gravelle, co-authors of Deciphering the Senses, believe that in light of this cultural relativity, while the temptation to compare cultures in terms of best and worst is strong, it would be unfair to do so. We have no absolute criteria by which to evaluate the world’s diverse cultures. This makes sense. If our individual and collective values are ultimately relative and arbitrary, any assumption or ruling that culture A is better than culture B is more likely a result of our prejudices than an unbiased conclusion. While this seems reasonable, it’s not entirely true. If a culture existed which recognized that we live in an illusion, if it actually had a goal beyond making us snug in the illusion, and if it could train us to distinguish reality from illusion, that culture would be immeasurably better than any other. It would be the best culture. Clearly this is a great claim to make on behalf of any culture. Nevertheless, one has to agree in principle that if such a culture existed, it could justly lay claim to being the best. The question is, does such a culture exist? The answer is yes. It is the Vedic culture, the same culture from which the concept of maya originated. Unlike other cultures. Vedic culture is specifically geared toward ridding us of illusion. It does this by teaching a technique of living in a way that transcends the senses. As Krishna describes it, true Vedic culture trains its adherents—man, woman, and child—to penetrate the relative world to the plane of absolute reality, the spiritual world. When you consider that no other culture makes such a claim for its masses and that our chances of getting out of maya’s fun house are otherwise remote, it makes sense not pass up too hastily the opportunity the Vedic world view offers. This proposal is even more attractive when you throw in the following considerations. An especially significant outcome of the revelation that we are inextricably snarled in illusion is that it voids the philosophers’ long-standing tradition of speculating about the Absolute Truth. After all, apart from its merit as a diversion—a creative way to kill time—what’s the value of our conjecturing over something beyond our ability to confirm it? This revelation voids the physical sciences as well, at least as far as any hope that they will one day yield a definitive understanding of our existence, for our scientists are as hopelessly deluded by their senses as everyone else. For all their hypothesizing, analyzing, observing, and naming, they are no more qualified to deliver perfect knowledge than you or I. A third and equally significant outcome of this discovery is that while we have heard “Everything is relative” many times before, we have no idea how relative everything actually is. The recognition of the reality illusion pulls all the stops on the range of possible explanations about the world. No longer can we assume that this is the best of all possible worlds and that we are the best of all beings in it. For instance, if we can accept that in a frog’s reality elephants don’t exist as elephants but as earth- shaking shadows, then we can accept as reasonable the Vedic literature’s assertion that demigods and other higher beings exist, and that although we might not perceive them in our reality, their actions affect our existence. The thought that we could be so limited by our senses is humbling, but it’s not preposterous when we consider the lessons learnt from the frog example. We know that in our reality an ant living in our flower bed is insignificant, but in the ant’s reality we may not exist at all. And yet every time we turn on the garden hose, we may affect that ant’s life. Why couldn’t our position relative to the demigods be a similar one? For all we know, our rain could be a demigod’s garden hose. It’s hard to believe at first that we could be that insignificant, but actually without the prospect of getting out of illusion, such as the Krishna conscious Vedic culture offers, the reality illusion reduces our existence to insignificance anyway. It reduces us to wormlike creatures that eat, sleep, mate, writhe, and contort for some time, and then die. All our achievements are but another loop and twist in the endless snarl called maya. They are laudable only until we realize they add up to zero. Once you appreciate this, you can easily see how the assumption, based on a tacit acceptance of the body as the true self, that somehow we will create a comfortable and lasting arrangement for happiness in a temporary world is an abjectly foolish one. This is precisely Krishna’s point to Arjuna early in the Gita, and it is echoed throughout the Vedic literature. The conclusion is that the only way to get information about reality beyond our illusion is from a source unaffected by the illusion, just as a person drowning in the ocean can be saved only by someone who is not drowning. This makes good logical sense, but it poses another problem: who qualifies as such a source? Obviously no one within the precincts of this world can claim such authority. Our discussion so far has proven this, and the Vedic literature itself pivots on the acceptance of that fact. Nevertheless, the Vedic literature points to Krishna as the person qualified to dispense transcendental knowledge, and supports its conclusion with much good reasoning to show that He has qualifications no one else can claim, namely that He is the Supreme Personality of Godhead, the creator and controller of material nature. Consequently, He is never subject to any illusion, even for a moment. Like a king, who can visit the state prison and not become a prisoner, Krishna comes to the material world but never comes under the influence of illusion. Rather, He delivers the knowledge that can liberate us from maya. This He did when He spoke Bhagavad-gita on the Kurukshetra battlefield. In the Gita you’ll find Krishna’s answers to questions such as: Is it possible to transcend the senses? What is the purpose of the world of maya? Is there an absolute reality beyond this relative one? Is it possible for us to perceive that reality as it is? Arjuna, the hearer of the Gita, asserts that no one less qualified than Krishna can answer these questions and remove all our doubts. But if it takes someone as qualified as Krishna to answer our questions, then why not consider His answers? Even if you are reticent to accept Him as the Supreme Personality of Godhead, which admittedly is no casual affair, still, as the original propounder of the doctrine of illusion, He deserves some credit for doing so. And that He did it back in an era we hardly consider civilized only makes His accomplishment all the more remarkable, credible enough in most eyes to merit a more in-depth scrutiny of His ideas.